Want more info on the Titans Draft? Buy our team-specific guide! The Tennessee Titans made the playoffs in 2017 and even won a game there, but their offseason actions suggested management was not content. The team fired head coach Mike Mularkey after two consecutive 9-7 seasons, a move that surprised many. But despite that winning record, there were plenty of reasons for concern. The team had a negative point differential on the season. They limped to the finish line, losing three of their last four games. And most distressingly, young quarterback Marcus Mariota turned in the worst season of his career in his third year, a time when young quarterbacks are often on the verge of breaking out. While the Philadelphia Eagles and Los Angeles Rams had tremendous results in 2017 surrounding their young signal-callers with offensive gurus and receiving weapons, Tennessee general manager Jon Robinson took a different approach with Mariota. Rather than replace Mularkey with an up-and-coming offensive mind, he hired Houston Texas defensive coordinator Mike Vrabel. And rather than give Mariota weapons in the 2018 draft, they looked to defense: Alabama linebacker Rashaan Evans, Boston College edge rusher Harold Landry, and Arizona defensive back Dane Cruikshank. The lone offensive pick was used on Washington State quarterback Luke Falk, taken late in the sixth round. Any offensive improvements will have to come from within, from Mariota himself, or a trio of 2017 picks – first round receiver Corey Davis, third round speedster Taywan Taylor, and third round tight end Jonnu Smith. 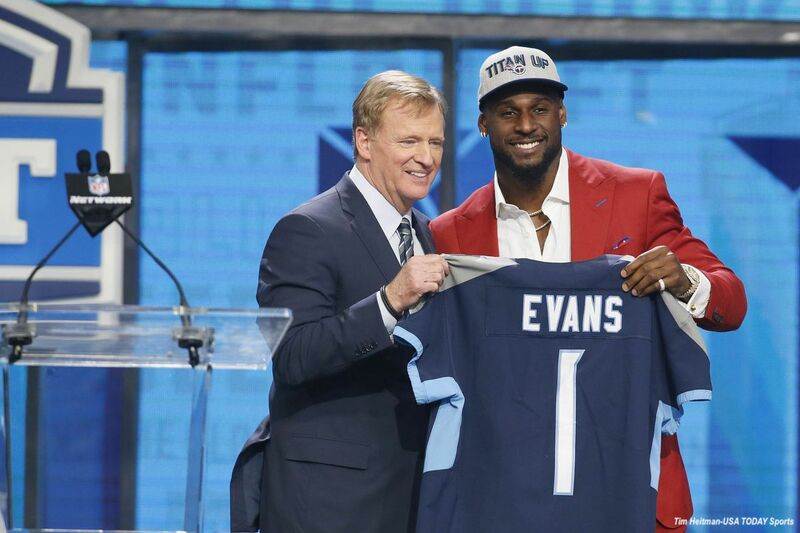 Evans only started for a year in the Crimson Tide’s loaded linebacking corps, but he demonstrated a great motor and the desired play strength and speed for a linebacker. His ability to both cover and blitz gives him the versatility to play both inside and outside linebacker – a flexibility that might remind Vrabel of his own playing days with the New England Patriots. Robinson, Vrabel, and defensive coordinator Dean Pees (who also spent time in New England) undoubtedly hope their first pick brings that kind of playmaking acumen. With the departure of inside linebacker Avery Williamson, a slot is open for Evans to start alongside Wesley Woodyard. He’ll be competing with free agent signee Will Compton and holdover Jayon Brown, but he’s the favorite to win that battle. The Titans have a solid pass-rushing duo in Brian Orakpo and Derrick Morgan, who combined for 14.5 sacks in 2017, but those two are getting older and the depth behind them is virtually nonexistent—Erik Walden, the team’s third edge rusher, had only four sacks in 2017 and is gone now. Landry’s senior sack production took a big dip from the 16.5 he tallied as a junior, but he figures to factor in right away as a rotational rush end. His run defense will hold him back some from early-down work, but he figures to play a significant role on passing downs at least. Landry was our second-ranked edge rusher in the ITP Draft Guide, with lead scout Nick Janssen noting that his explosiveness, upfield burst, and cornering were all elite. That showed up in his athletic testing, where he scored a 9.43 Relative Athletic Score on the 0-10 scale. If he can stay free of the injury woes that derailed his senior season and caused him to slip to the second round on the draft, Landry figures to add an injection of youth and athleticism to an edge rushing corps that needs it. The Tennessee secondary is pretty set with cornerbacks Malcolm Butler, Logan Ryan, and Adoree Jackson along with safeties Kevin Byard and Johnathan Cyprien, but the group is light beyond that quintet with Brice McCain and Da’Norris Searcy no longer with the team. That opens a role for Cruikshank, who played both cornerback and safety for the Wildcats. He can back up both positions and his athleticism will translate to special teams as well. Lead scout Kyle Morgan noted that Cruikshank’s long-legged build hinders his short-area quickness, but with Jackson and Butler in the defensive backfield, they can avoid matching up Cruikshank on small, shifty types. More concerning are his tackling woes and lack of consistent snap-to-whistle effort, but he’s a nice gamble as a fifth-round pick. Like Landry, he also graded out as an elite athlete (RAS of 9.69). Tennessee is all set at quarterback with Mariota, the second overall pick in 2014. Longtime backup Matt Cassel is gone, however, and while they replaced him with veteran Blaine Gabbert, the former Jacksonville Jaguar has never lived up to his top-10-pick billing. Falk might not be ready to compete with “The Real American” for backup duties in 2018, but he can provide depth as a third QB or on the practice squad this season. Falk lacks a top-notch arm but his short-area accuracy, pre-snap reads, and understanding of defenses make him a good fit as a long-term backup. His biggest weakness is “quicksand”; lead scout Mark Schofield explains, “If he makes a mistake, such as throwing a bad interception or missing a big play downfield, it might take a drive or two for him to rebound.” Moving past bad plays mentally will be key to a long-term NFL career for Falk. Akrum Wadley, RB, Iowa – One of the biggest moves Tennessee made in free agency is signing Dion Lewis away from the Patriots. Like Lewis, Wadley is a smaller back with change-of-direction skills. He can win a backup job given Lewis’ injury history. Deontay Burnett, WR, USC – Eric Decker led all Titans WR in receiving yards last year, but the veteran is gone now. The team will undoubtedly hope Corey Davis, the fifth-overall pick in 2017, will pick up much of the slack, but there’s room for the speedy, agile Burnett to carve out a role, potentially in the slot. Damon Webb, S, Ohio State – Cruikshank isn’t the only rookie DB who can carve out a depth role with the team. Like the fifth-rounder, Webb played both CB and S in college. He can potentially back up FS Byard with the versatility to fill in elsewhere in a pinch.